A fine Cuvée Prestige espresso with grand aromas and noble acidity for the distinguished Espressionist. A blend composed of 100% Arabica coffees. Each cultivar is roasted separately and then “cold-blended” as inherited from Venetian tradition. Each of the cultivars is associated with the name of the plantation or the individual grower. 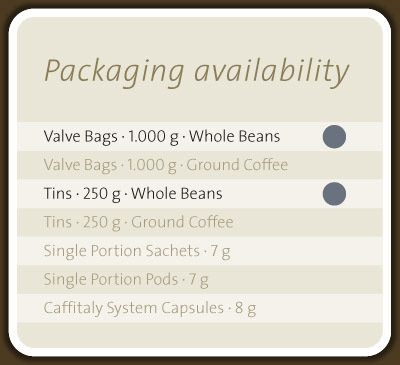 The direct and exclusive importation allows for complete authenticity as the beans can be traced back to their origins. The aromas and flavours of each single origin are noted in each cup. © a Maromas Group trademark. All rights reserved.